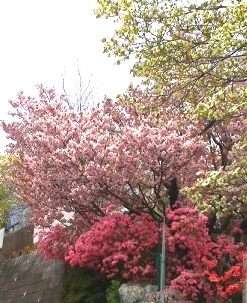 Double cherry blossom(八重桜, yae-zakura), flowering dogwood(花水木, hanamizuki) and rhododendron(石楠花, shakunage) are blooming in my town. I often hear a Japanese bush warbler singing. According to Chronicles of Japan, the 22th day of 2nd month in the lunar calendar is the anniversary of the deatn of Prince Shotoku(聖徳太子, 574-622 or 629). Shoryo-e(聖霊会) which is the annual memorial service for Prince Shotoku including a parade, Gagaku(雅楽, ancient court music and dance) were held on April 22th in Horyu-ji Temple(法隆寺) and Shitenno-ji Temple(四天王寺). Those temples were built by order of him. Horyu-ji usually holds the service on March 22th and does it on April 22th once every ten years. These are some costumes of the dances performed in Shitenno-ji. Dancers dressed in colorful costumes perform in groups of four or five each. This dance expresses an enjoyable drinking party. Some people say the dance came from the custom that brewers held an event to commemorate the god of furnace and well in an ancient kingdom located in southwest Korea. Some say this dance music was modeled on a song of a bird during the Sui or Tang dynasty in ancient China. This is performanced on celebratory occasions. Garyobin is the dance of Garyobinga(迦陵頻伽) which is an imaginary creature in Buddhism, part human and part bird. It is believed that it lives in Sukhavati(Amitabha's Pure Land). Kocho is butterfly dance. This dance and its music are said to be made in 906 in Japan. Two groups dance together on each side of the stage. Garyobin is performanced on the left side of the stage and Kocho is done on its right side. Both of them are performed by boys (or women). This illustration depicts dancers on pleasure boats with dragon head and imaginary bird head. A score for Asian lute (Biwa called in Japan) is found on the reverse of a Buddhist scripture discovered in the Mogao Caves of Dunhuang(敦煌) in China in 1900. Gagaku was originally the Chinese ceremonial music, but it died out completely in China. The discovered score is very similar to the biwa score that is in use nowadays in Japan. Its title is about the same. Some gagaku musicians restored the piece in the style of Japanese gagaku. The Court musicians of the Imperial Household mastered the playing skills of western musical instruments through training in the Meiji Period and perform at events at the Imperial Palace.